The majority of the time, I can ”figure out” a car pretty quickly. I usually give them a quick glance, form an opinion on them, then move on to the next interesting car. Not with this one. Not with this 1980 Mercedes-Benz 280SLC. It started out harmless enough. 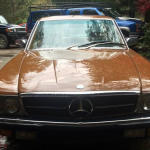 A listing for a $1,500 for a 280SLC. Naturally I’m intrigued by this. The 280SLC with the M110 inline-6 engine was never officially sold in North America so this was a big plus for me. 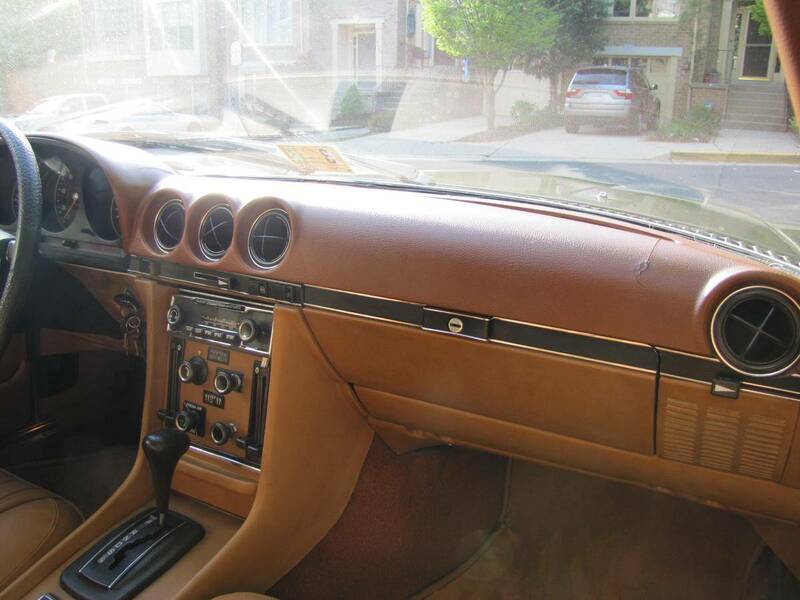 Then I peeked inside and saw a manual transmission – things are looking even better. 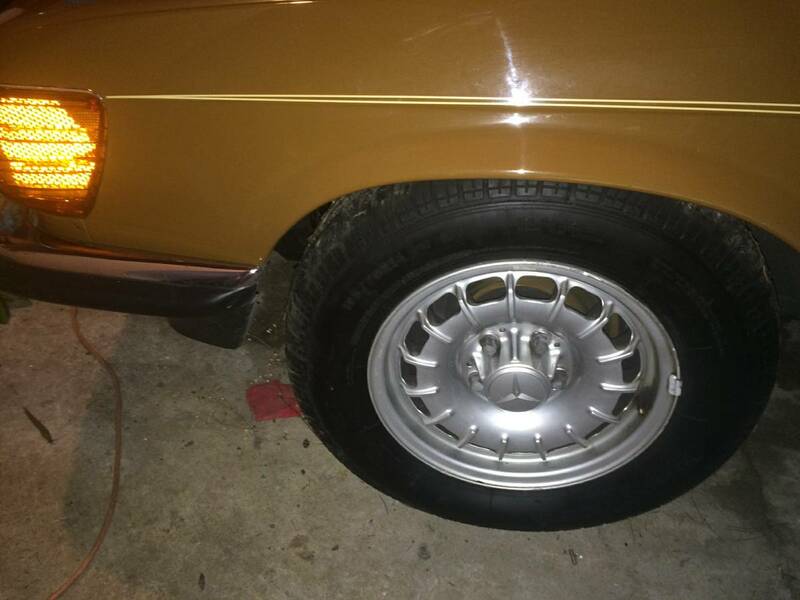 Yes, it’s pretty rough looking, but the extra parts the seller is throwing in with the car could make this deal worth it especially since one of the parts looks to be a real pre-merger AMG bumper. But when I really started to do some digging into this car I was just confused. 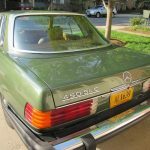 Lost in the sea of Mercedes-Benz R107s is the SLC that is one of those ”Oh yeah, I remember those” cars because honestly, you just don’t see them anymore. 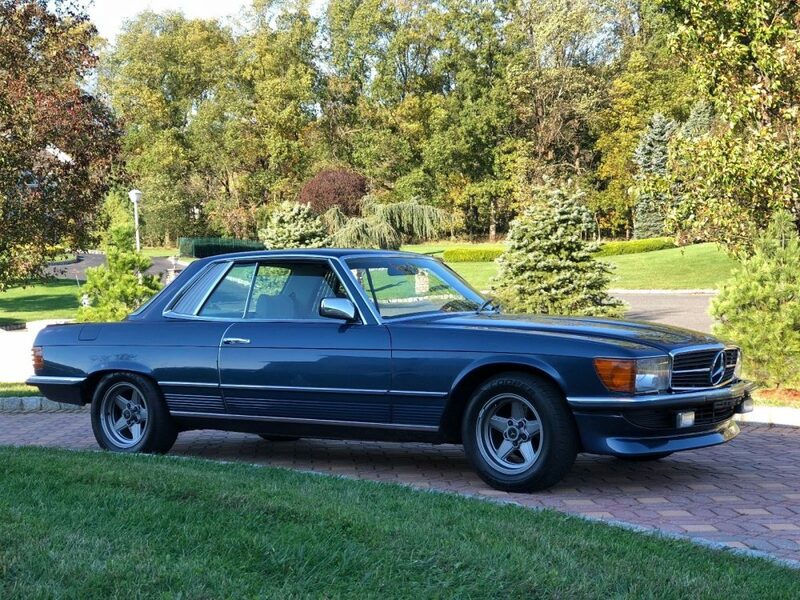 I’ve checked them out before, but none like this one for sale in New Jersey. 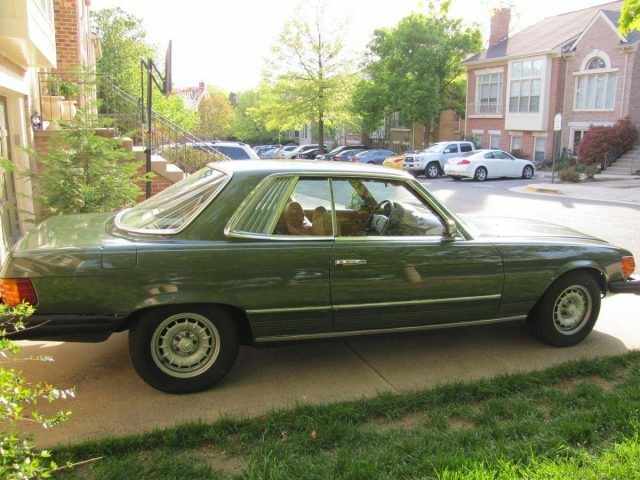 This is the ultra-rare 500SLC 5.0 which doesn’t sound like much right now, but let me explain. Mercedes-Benz actually ran the SLC in the FIA World Rally Championships and in order to do so, they had the homologate the cars as they ran 5.0 liter V8 SLCs in the races. 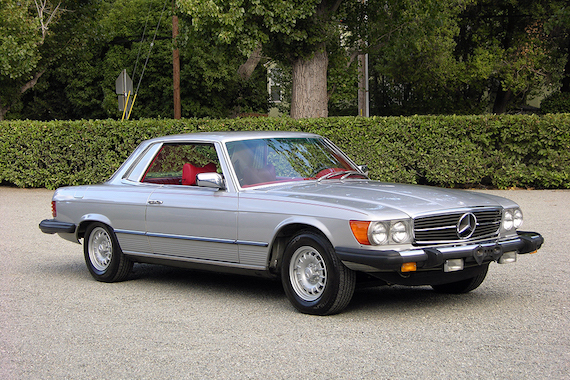 Mercedes wwas only making the 4.5 liter cars at the time so a 5.0 liter car for the streets was necessary. 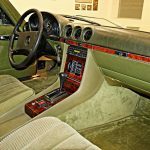 Like most homologated cars, the production numbers were extremely low with justÂ 1,133 500SLCs being made over a few years. None of these cars were ever made for North America, but somehow there is really nice for sale in America’s favorite state. But the price? 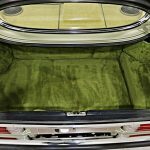 All those creme puff 560SL owners will be jealous. Produced between 1971 and 1981, the C107 was a fixed roof, four seater coupe based on a longer version of the R107 chassis. Badged as an SLC, it was effectively an SL in 2+2 configuration, with a modest amount of room in the back for a couple of (small) adults. TheÂ 4.5 liter V8 in the 450Â put out a meagreÂ 190 hp, so itÂ wasn’t all thatÂ fast. 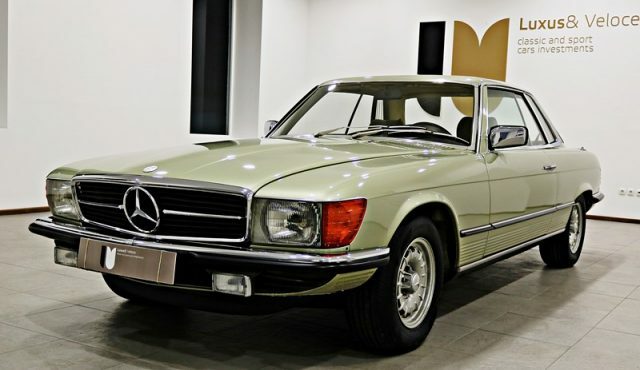 But it was, and remains, a gorgeous and classy cruiser whose looks neatly capture that moment at which theÂ design language of the late 1960s began to give way to that of the 1970s.Â Even in elongated form, the car retains the timeless good looks of the SL. 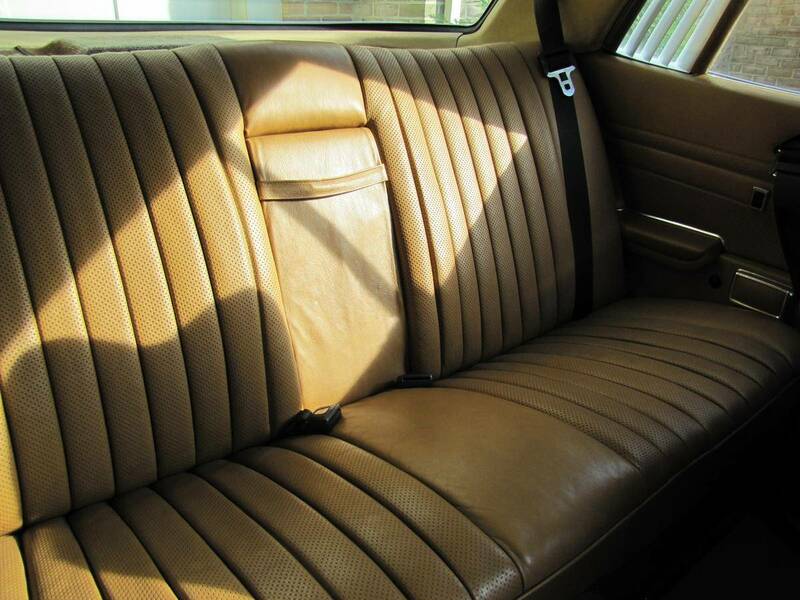 ThoseÂ pleated, curtain-looking louvres behind the rear windows?Â I always thought they simply gave rear passengers a bit of privacy while also letting in someÂ light. But a bit of internet researchÂ reveals they have another purpose. They allow for shorter rear windows that canÂ slide downwards into the body without hitting a wheel arch. This means the car can retain a completely pillar-less look. A typically German solution to a problem: practical and elegant at the same time. 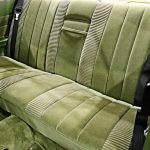 I’ve been on a little bit of a green kick as well as a featuring a few C107s of late. 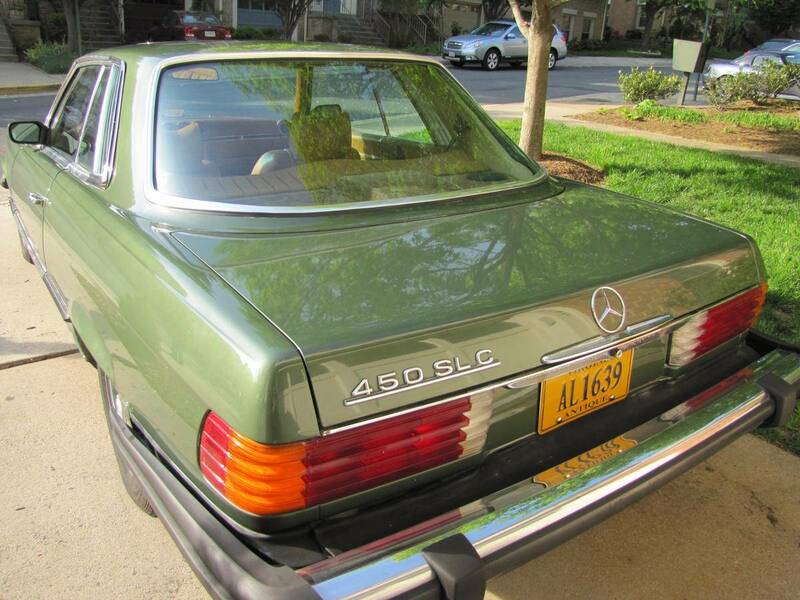 So why not combine the two and feature an outstanding 450SLC that is absolutely covered in the color green? This 1980 up for sale in Portugal has a nice lighter shade of green in Silver Green Metallic on the outside, but it’s what is inside that really blows you away. 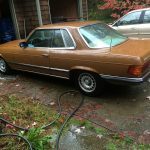 1980 Mercedes Benz 450 SLC 48.000Kms Perfect untouched Condition! 1 Portuguese Owner from New! 100% Factory Paint â€“ All the Factory assembly marks and wax protection! All the books; Keys; Tools. Impossible to find another one in this condition! This car was order new by Portuguese emigrant in South Africa. LHD special order. When he came back to Portugal in 1987 the car came with him! This car was bought directly by us to the 1st owner. This car was part of small classic car collection. The last owner was a successful entrepreneur in the car business in South Africa and actually itâ€™s a business man in the automotive area at Portugal. This car was always extremely well care by the owner! Itâ€™s impossible to find another one in this condition! I personally love the color combination on this car. Yes, it’s about late 1970s/early 1980s as you can get, but I think that’s the beauty of it. It’s basically a step back into that era in every way. 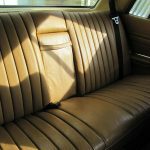 You can get in this car and suddenly you are transported back 37 years. Everything is nearly factory perfect on this car outside of a dented up muffler and a rusty exhaust pipe. Otherwise, it’s as good as it gets. One thing I did find a little odd about this specific car is that the 450SLC badging is on the wrong side on the trunk lid. Mercedes always put them on the left side up until about a year ago (Don’t ask me why they changed, I think it’s a dumb idea) but the thing that gets me is that the badging should be held on with three little pins that insert into the trunk lid. This means the trunk lid had to have the holes filled on the left side and three new holes drilled on the right. I suppose they could’ve just snapped the three pegs off then used adhesive to attach the badge. Either way, this strikes me as a little odd. As for the price, I can’t believe the bidding on this car is up over $38,000 and probably still has a little bit to go. Maybe the Portuguese love the C107 or the color green, but it’s pretty shocking to me how much this 450SLC is set to gather. I’ve posted examples of C107s selling for very little money on the side of the ocean so this is a little surprising to me. 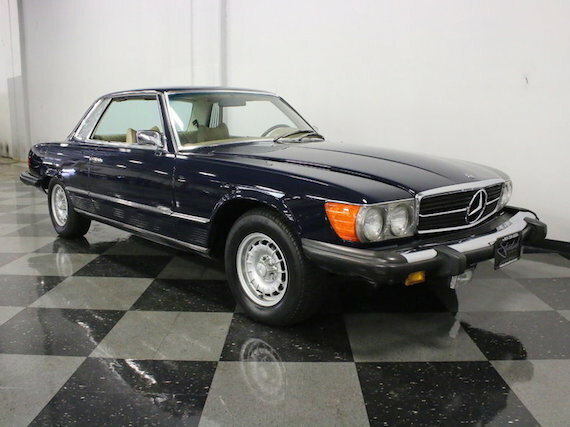 Granted, they weren’t in the shape this one is in, but I never thought I’d see a 450SLC even with under 30,000 miles approach almost $40,000. 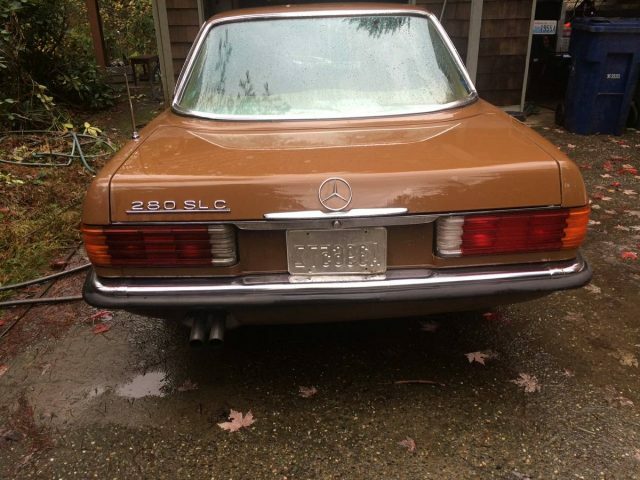 About a month again I looked at a 1980 280SLCÂ which I found intriguing for two reasons: the relatively low cost and its rare color. 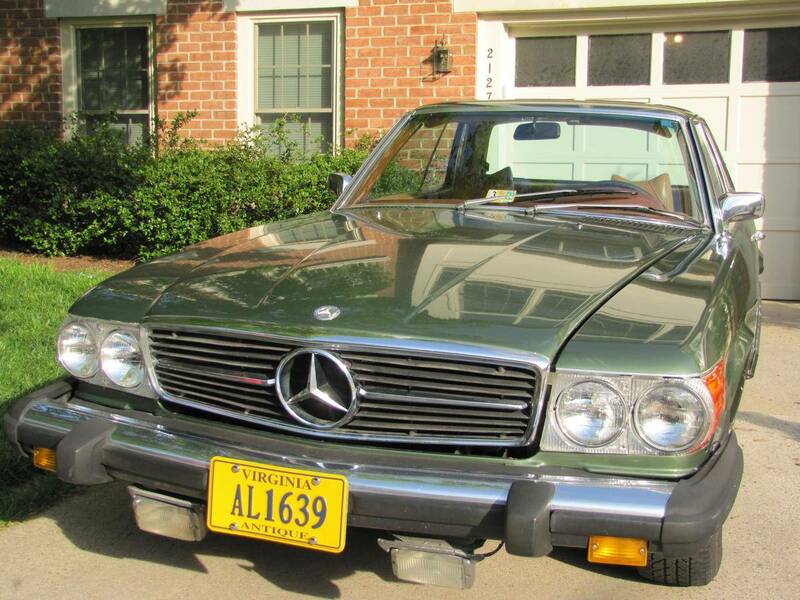 Today’s 1974 450SLC for sale in Virginia is a car along those same lines. It is presented in a nice color and, surprisingly, at an even lower cost. 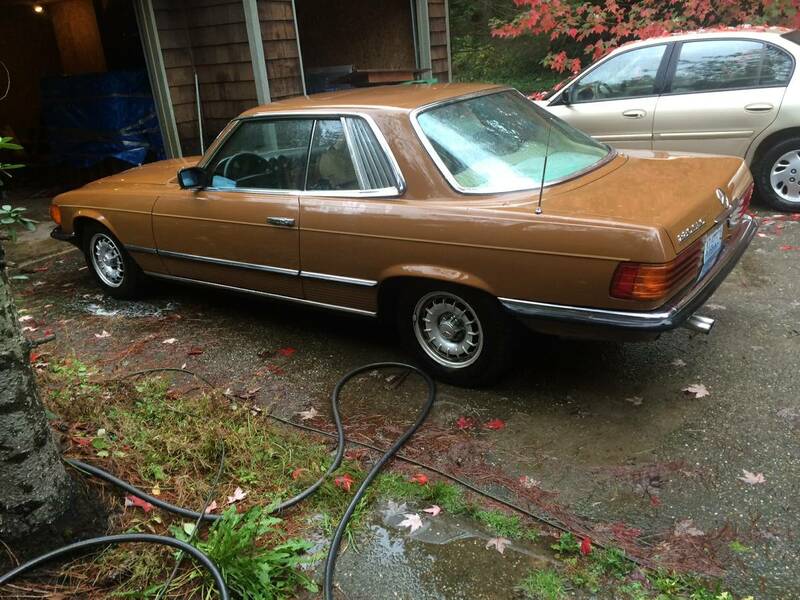 It has its flaws but that is probably to be expected for a Mercedes as cheap as this one is. 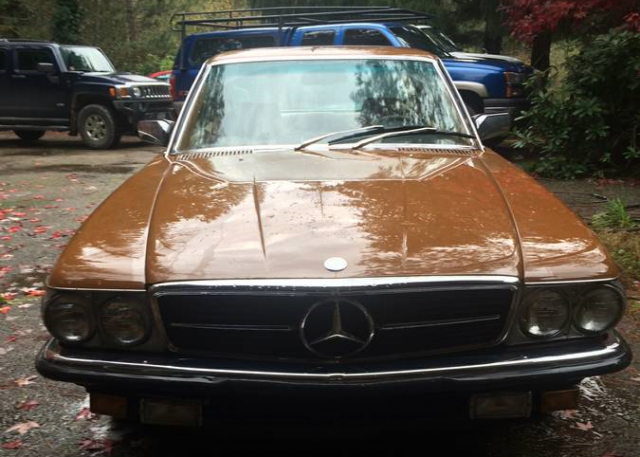 Like I mentioned before, the C107 surely isn’t my favorite Mercedes ever, but deals like this one have me softening my stance on them. 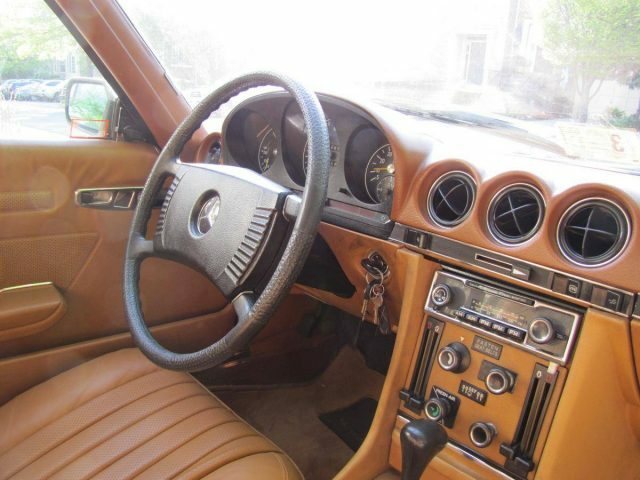 Classic and rare 450SLC 4 passenger coupe. 275.8 V-8 with overhead cam shafts, electronic fuel injection, 5 main bearings, positive valve rotators & transistorized ignition. 3 speed automatic transmission with torque converter, disk brakes on 4 wheels with power assist, power assist steering, 2.7 turns lock to lock. 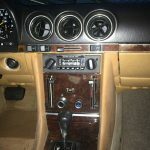 Needs: AC repair (or replace) and new radio or sound system. The AM/FM original system only works well on the AM setting. 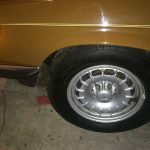 The paint and trim are in good shape, two small “bubbles” near the tire wells. See the photos for clarity. 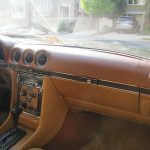 Work done: We have replaced the radiator, hoses, and clamps, (2) front headlight systems, front bucket seats to match original rear leather seats, battery is recent. The car runs well and has been garaged in Virginia. We’re downsizing and won’t have the space to keep it. I must admit I am a sucker for dark green cars. 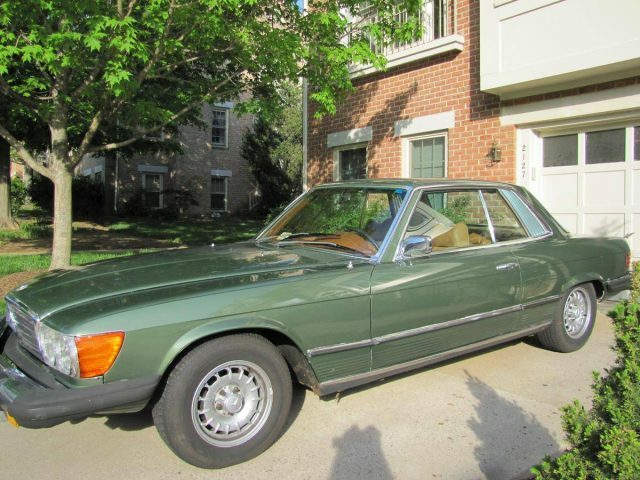 I’d buy all my cars in dark green if I could, but sadly when dealing with the cars I personally buy (old Mercedes), color is usually the last thing I can be picky about. The paint on this 450SLC looks fairly clean outside of the few rust bubbles that have popped up. The small spot on the lowerÂ louvers worries me a little because replacing that kind of metal work is a lot more difficult to fix than the standard flat metal. Inside, the interior needs some love with a cracked dash and some visible dirt, but nothing that couldn’t be fixed in a weekend. 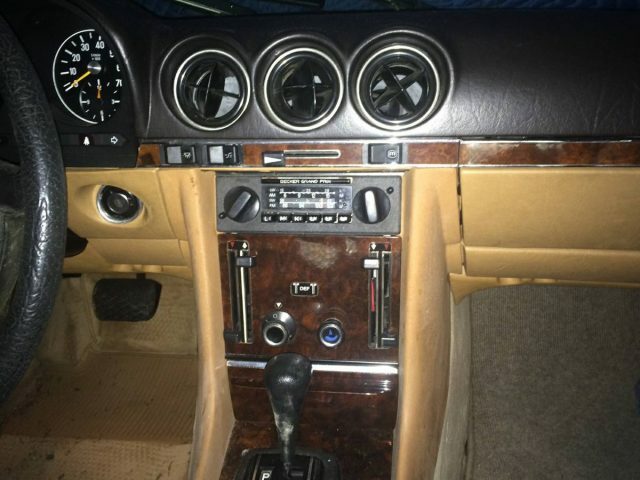 Mechanically, the seller says it does need the A/C repaired but I’ve yet to personally meet a old Mercedes that actually has a functioning air condition system. So for me, it’s not a deal breaker. 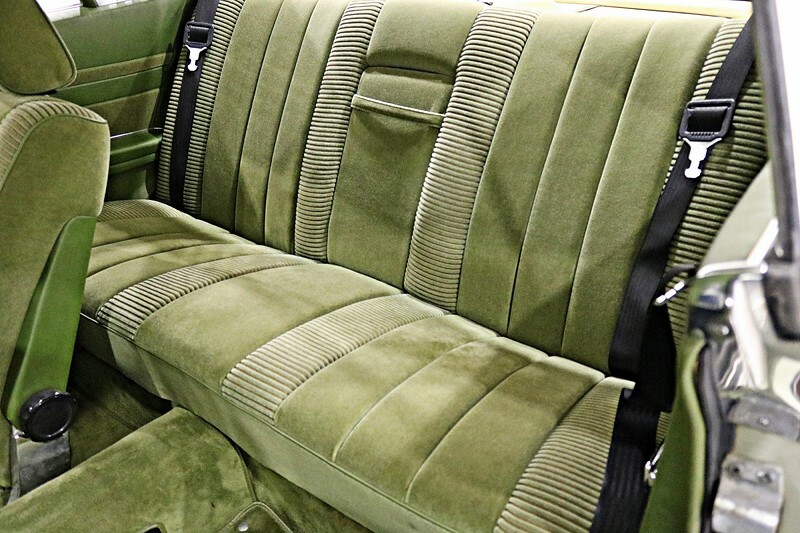 The price of $4,750 is more than fair for this C107. 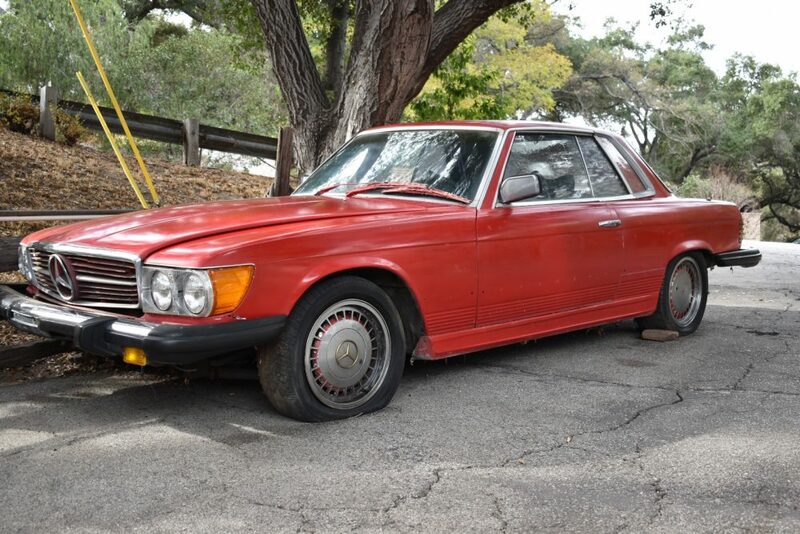 If this was a 450SL, the seller would be asking $14,750 or maybe even more. The mileage of 100,000 has me wary a little bit as this car might need a timing chain and plastic sliders as well as the hydraulic tensioner with its own plastic slider. It’s about $800 in parts alone but it’ll keep this M117 happy for another 100,000 miles. 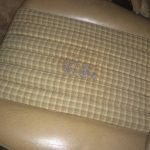 So if you are looking for a little bit of a rare project car, this one has some real potential in it. I go back and forth as to whether or not I like the C107. 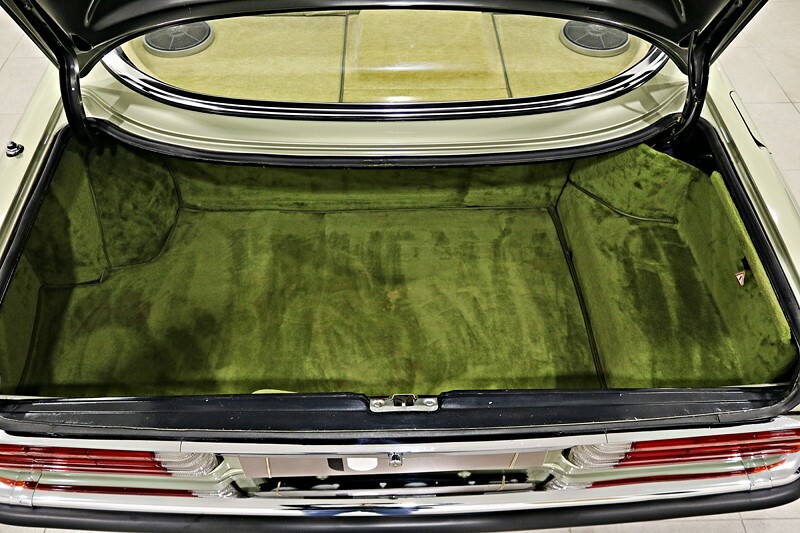 It was just a R107 with a fixed top, 14 more inches added to the wheelbase and some small rear seats. The biggest thing that really turns me off to this car are those window louvers. My eyes are always drawn directly to them and how awkward they look. I understand they needed to differentiate this car enough to sway buyers from the SL and probably couldn’t engineer a window regulator to fit in that space with a large piece of glass, but there had to be another design option on the table. Now that it’s 2017 and I very rarely even see a C107 in the wild, I’m starting to soften my harsh opinion on them. Today’s car, aÂ European market 280SLC in Goldbraun, is certainly helping that cause. Having been accustom to the standard 450SLC with the giant diving board bumpers and those awful chrome wheel arches, this C107 is a breath of fresh air. The M110 twin-cam engine is no powerhouse with only a 185 horsepower, but it should be adequate for this car. 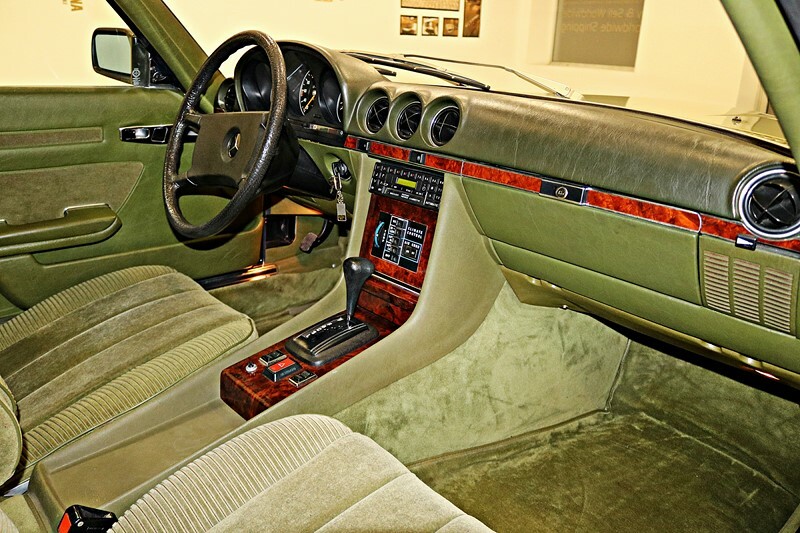 Inside, the plaid cloth interior, Â manual climate control andÂ Becker Grand Prix 470 radio are all welcome as what I think is an improvement over what came in the U.S. 450SLC cars. Outside the Goldbraun paint is very rare and look great with clean Bundts and those amazing slim European bumpers. 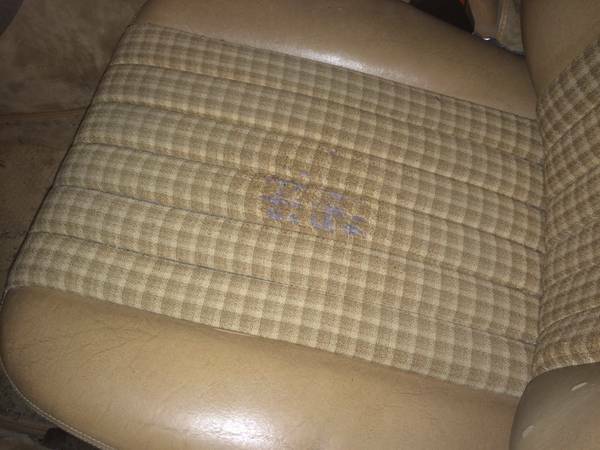 For $5,500, this is a really good price. If I wasn’t on the other side of the country I’d be on my way to check this thing out in person. 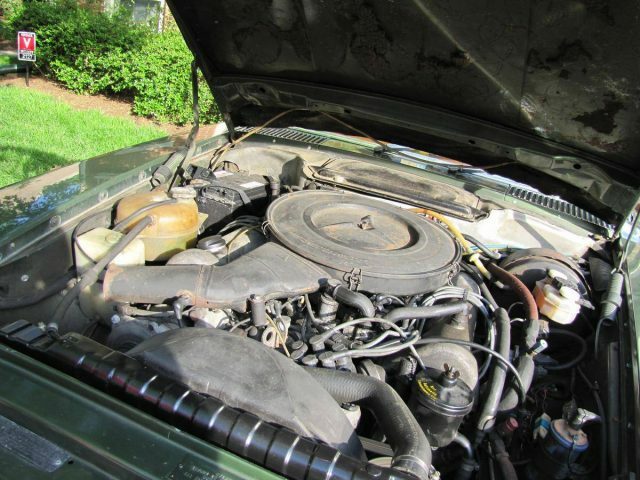 For the price you can’t really go wrong given the seller says this is a two-owner car that was dealer serviced its whole life and doesn’t have any rust. This car probably needs the standard $500-1,000 in repairs when you buy it but I still think you’ll come out ahead on this car if you pick it up. I’m not suggesting the C107 is or will be any kind of collector car, but this specific car checks all the right boxes for a desirable car. 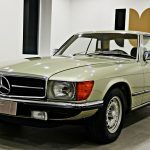 Rallying and Mercedes-Benz are terms that don’t seem to go hand in hand, but at the end of the 1970s, a most unlikely contender would emerge on the scene. 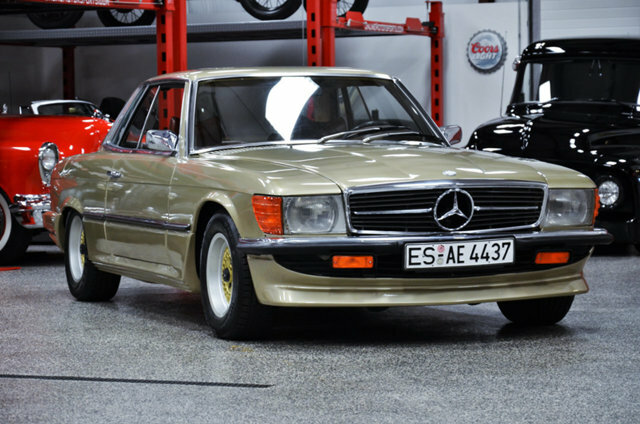 The C107 Mercedes-Benz 450SLC 5.0. This homologation special would do battle in the 1978 World Rally Championship. Later, the car would become known as the 500SLC. What differentiated these from a normal C107 SLC? A brawnier V8 engine with 240 horsepower, aluminum hood and decklid and a small rear spoiler on the edge of the trunk. 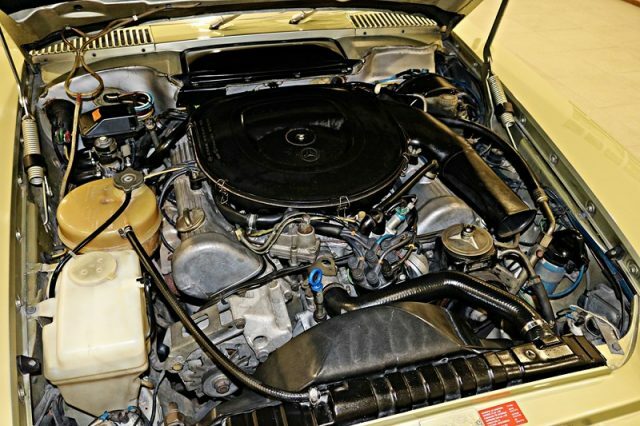 The 500SLC would bring to the fray a 4-speed automatic, replacing the 3-speed automatic that did duty in the 450SLC 5.0. 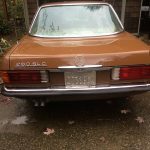 Only 1,636 examples of the 450SLC 5.0 and 1,133 examples of the 500SLC would be produced, making this 500SLC for sale in California quite special. 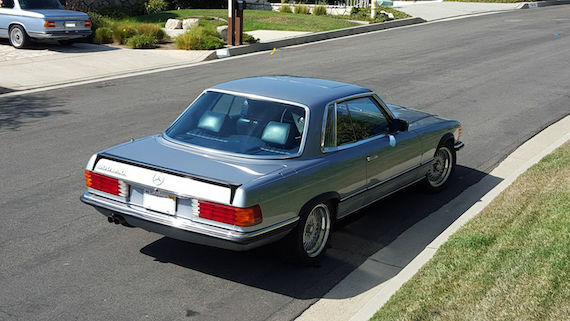 Even despite it’s somewhat awkward proportions, I was always a fan of the Mercedes-Benz C107 SLC. 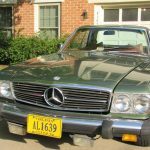 This car lasted barely for a decade before it was pulled in favor of the S-class SEC coupe that debuted in the early 1980s. 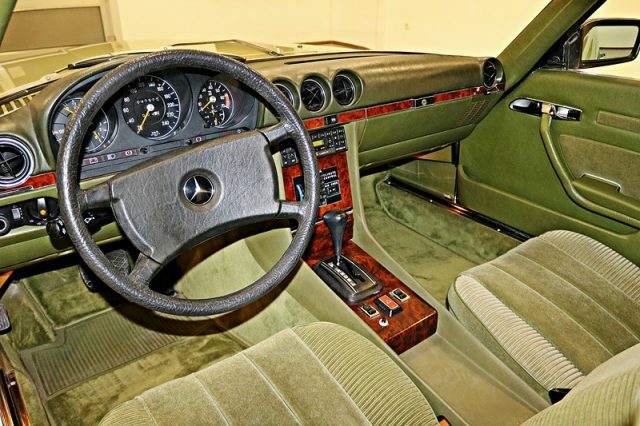 Somehow, the SLC is relegated to a rather curious position in Mercedes-Benz history as the only four-place coupe to be based off the SL roadster. 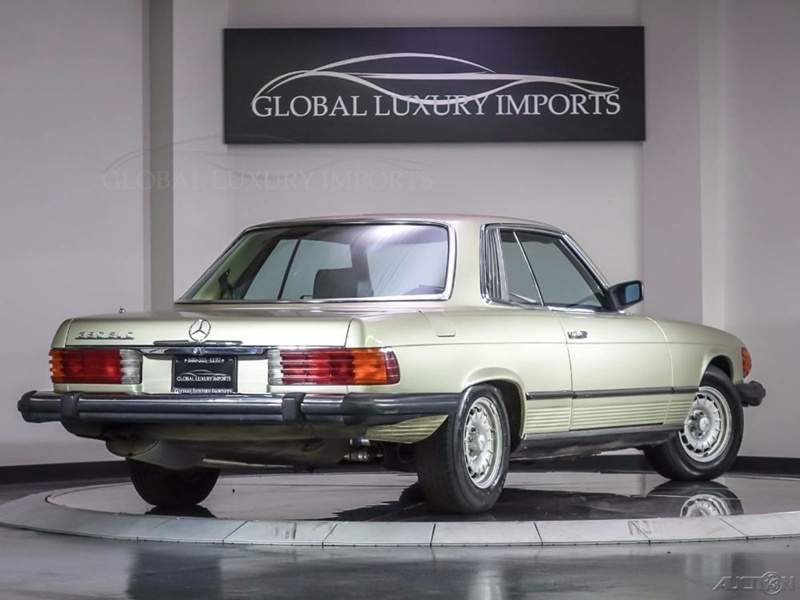 This 450SLC for sale in California is about as good as they come these days, in a very eye-catching combination of Astral Silver over red leather. 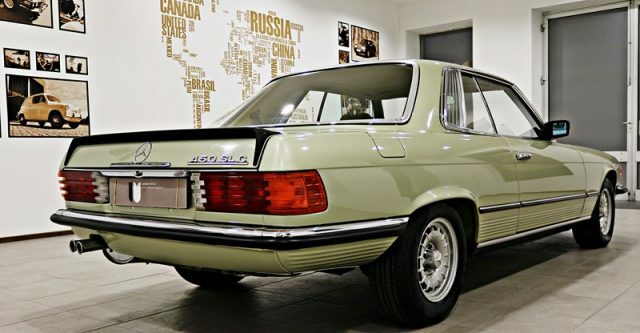 If you want the style and grace of an R107 but perhaps don’t want the convertible or the higher entry cost of the 560SL, you should spend some time looking at a car like this.